On Wednesday, March 20th, the center-right European People’s Party (EPP) bloc suspended Hungary’s governing right-wing populist Fidesz party as the conflict between globalists inside the EU and Viktor Orbán climaxed in the European parliament. For some years now, the Hungarian government and Soros have had an intensely adversarial relationship. Orban’s Fidesz party first launched a nationwide billboard and television advertising campaign which targeted the Hungarian-born American billionaire in the summer of 2017. The campaign used an image of a laughing George Soros with the slogan ‘Let’s not allow Soros to have the last laugh!’ Orban has long accused Soros and his Open Society Foundations of interfering with domestic affairs in Hungary. Fidesz’s recent poster campaign against Soros and Juncker was condemned by globalist EU officials and centrist members of the EPP, who accused Orbán’s party of employing fear-mongering tactics and propagating ‘conspiracy theories.’ Some individuals inside of the bloc called for apologies from Orbán, threatening that Fidesz wouldn’t have a place in the EPP without one. 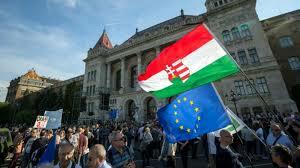 But Orbán stood firm and argued that the projected electoral success of right-wing populist, anti-mass immigration parties in the upcoming European Parliamentary elections should make members in the center-right bloc more empathetic to Fidesz’s point of view.